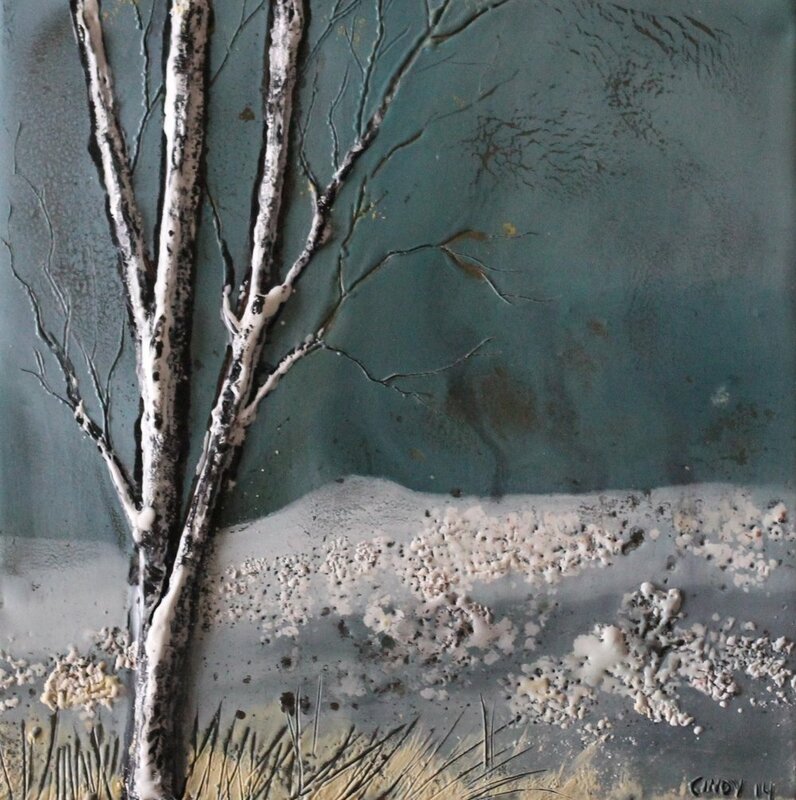 Encaustic painting is an ancient art form using melted beeswax, a tree sap called damar resin, and pigment to make encaustic paint. Encaustic means "to burn in" and was first used by the Egyptians to create the Fayum mummy portraits. Each layer of beeswax must be fused using heated tools such as a torch, heat gun, or an encaustic iron. Beeswax is compatible with many other art materials and media such as pastel, ink, oil paint, and collage items. Wax can be applied in thin, translucent layers or built up to become sculptural in nature. No, encaustic paintings are safe in your home or office, even in a warm room. Wax starts to melt around 150 degrees Fahrenheit, so there is no need to worry about your painting melting on the wall. Encaustic paintings could be damaged by extreme heat or cold, and the surface of a painting could become tacky or melt if left in a car on a hot, sunny day. Avoid hanging an encaustic painting in direct sunlight or in a spot where it is warm and breezy, such as in a sunny entryway by a screen door. 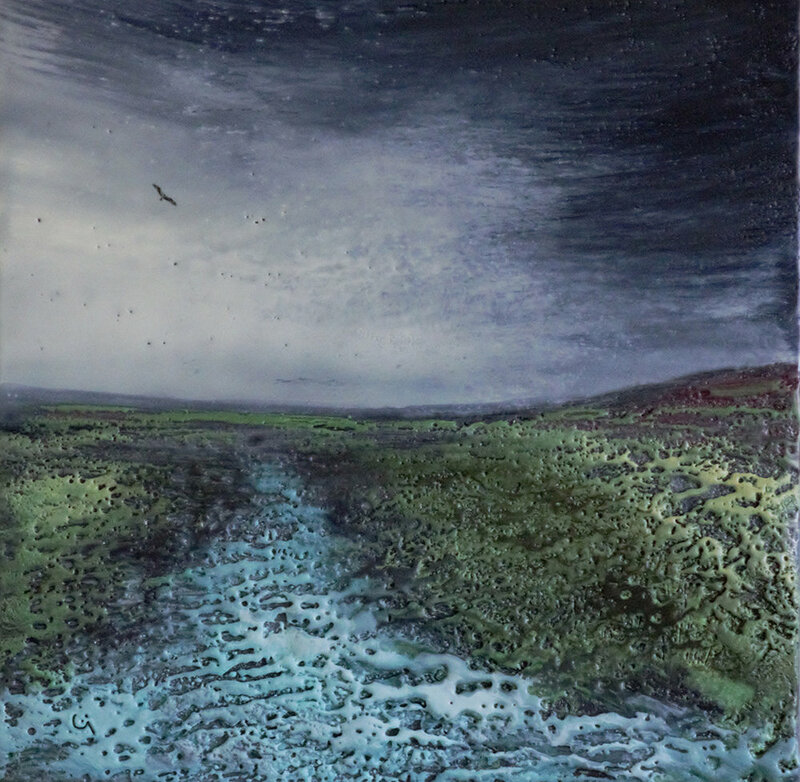 DOES AN ENCAUSTIC PAINTING NEED SPECIAL CARE? No special care is required, but encaustic paintings may become slightly hazy as the wax cures and hardens. This natural “bloom” can easily be buffed away with a soft lint-free cloth such as an old cotton t-shirt or microfiber cloth. Be gentle when buffing so you do not scratch the surface of the wax. The wax bloom will lessen over time to the point where buffing will rarely be needed. When packing or storing an encaustic painting, wrap it with tissue paper or baking parchment to keep dust from settling on the surface of the painting and to protect the wax from scratches. Yes. Encaustic was first used to create the Fayum mummy portraits and have survived thousands of years in very good condition.